I continue to see articles on the subject of social media strategy that go on endlessly about how many times to post of various platforms, how to respond to comments whether positive or negative, ensuring that your content is quality and not quantity and a wide variety of what I consider tactics, not strategy. The major difference being that strategy is a plan to achieve a goal while tactics are the methods utilized to achieve the goals of the strategy. 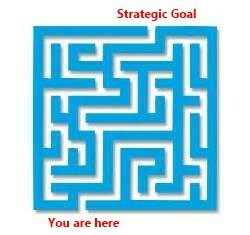 Strategy comes first and tactics are then developed to support it. What sets you apart from competition? Where is your ideal customer on social media? What are your specific social media goals? Should you blog? If so, what will be the theme? How and what will I monitor? What is my crisis management plan? Assigning a social media manager and their authority and responsibility. What will be your social media posting schedule? How much will you post? Who is responsible for responding and how they will, to comments both positive and negative. Setting up platform to monitor and measure social media efforts. Collection of contact email for follow-up. The above guidance is by no mean all inclusive however, it is important to understand that social media strategy is a long term view with goals sometime in the future while social media tactics are those activities that you will perform on a daily basis to achieve those goals. As an example let’s look at Facebook. Your overall strategy for Facebook may be “to increase the number of new and returning customers through Facebook to purchase your product of service within the next year”. The tactics you employ would include: educate your readers on the problem that your product or service solves, provide them information to help them in determining whether they need your product or service and provide incentives such as coupons or special deals on your product or service. By educating and informing and then providing a call to action through coupons and specials you hopefully achieve your strategic goal of converting them into customers. Your tactics must also include monitoring and measuring to determine if your tactics are effective. A proper social media strategy coupled with sound social media tactics will provide you with an effective campaign that will, over the long term, produce positive marketing results.